Installerstore.com is in the process of making some improvements to our site. 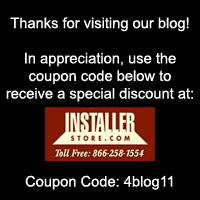 If you try to visit www.Installerstore.com, you may see this image… Our apologies! As soon as the updates are made, our site will be back up! If you have any questions on our products, existing orders, or would like to place an order, our staff is available at 866.258.1554. Thank you!